Robyn: One great thing about going during low-season was having every beach completely to ourselves. The most picturesque beach was St. Jean by far, with Eden Rock Hotel providing a nice back drop. The waves were breaking quite far out, so the ocean where we were swimming was perfectly calm. 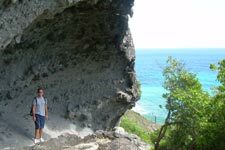 Erik: As an outdoorsy kind of guy my favorite beaches were Saline and Colombier. Saline is a little more rustic than the other beaches, but no less beautiful. A short stroll from a small parking lot takes you over a hill which descends onto the beach. As you gaze at the islands in the distance and marvel at the green hills that surround you, this beach feels like you stumbled into a secret, unspoiled part of the world. If you enjoy hiking, then the 15 minute walk from the end of Flamands Beach to Colombier is a must. As you stroll along the cliff sides overlooking the crashing waves below, keep an eye out for a variety of wildlife. We saw an assortment of lizards, birds, and Robyn’s favorite, large spiders. 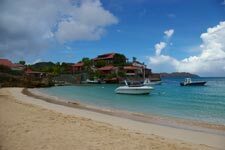 There were only a few times I thought Robyn shrieked…When you arrive at Colombier and descend a wooden staircase to the shoreline, you immediately notice rock outcroppings scattered along the beach. Snorkeling here was by far the best – large schools of tropical fish, interesting coral, and sea turtles easily discovered as you swim over the boulders. 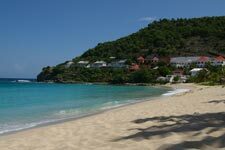 Robyn: Colombier was a beautiful beach, but I’m not quite sure that I would be up to the nerve-racking hike again. It was so creepy hearing the sound of about 10 lizards scattering with every step, and I won’t even begin to mention the silver spiders that seemed to ‘float’ in the air. Next time I think I’ll just rent a boat! Flamands Beach was incredible and definitely my favorite. It had everything you could ask for in a beach: crystal clear water, perfectly fine sand, and the occasional large wave you could ride in. Erik always wanted to immerse himself in the local culture, but surprised me when he dived in au natural for awhile! Robyn: In closing, I’ll just have to say that there is absolutely no better way to spend a honeymoon than relaxing in your own private pool in your own private villa. It was such a great escape from the world…hiding out with your new husband, not watching TV or working on your computer; it was just me and him, and a bottle of champagne. St. Barts was gorgeous and definitely lived up to the hype. I can’t wait to go back, and next time we’ll try and plan for the high-season so that we can enjoy even more fabulous meals, experience the night-life, and test out the shopping! 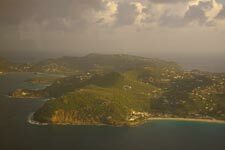 Erik: Spending our honeymoon in St. Barts was a dream-come-true! Now that I understand just how accessible this tiny island is, plus the benefits of a villa, I don’t see how I could ever go back to hotels again. When friends ask us if we would like to go back we often reply, as soon as we acquire more vacation time!